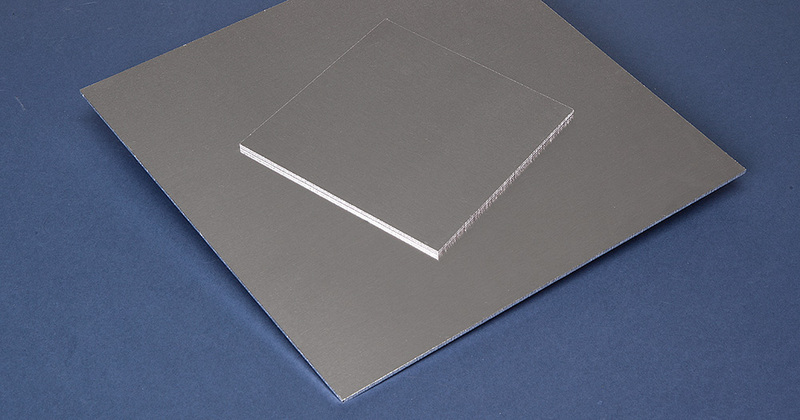 Whisperdamp NM (Noiseless Metal) is a range of products for damping structure borne sound, consisting of two metal facing sheets bonded by a viscoelastic core. The sound damping qualities of the viscoelastic core are temperature and frequency dependant. For this reason NM panels are supplied with cores optimized for different temperature ranges, depending on the applications in which they are to be used. The two metal facing sheets in NM panels are usually cold rolled steel, (Often referred to as Noiseless Steel) but in principle any type of metal or alloy can be used, as can surface-treated sheet of various kinds. The metal facing sheets are ideally equal thickness, but a certain amount of asymmetry can be tolerated with minimal loss of acoustic properties. NM serves a dual purpose. It damps the resonant modes of the structure borne sound and it replaces the sheet material that would otherwise be used in the construction of the component, without any increase in thickness or weight. The acoustical deadness of NM is often sufficient to replace the need for additional heavily loaded polymer layers needed to screen the noise radiation.